Border Crossing is an over-lifesize fiberglass sculpture by Texas native Luis Jiménez. In this monumental work, Jiménez depicts a Mexican man carrying a woman and infant on his back across the Rio Grande River. Border Crossing was conceived as a tribute to the artist’s grandfather, who, with his grandmother and father, illegally crossed the border between Mexico and Texas in 1924. As Jiménez later described: “I had wanted to make a piece that was dealing with the issue of the illegal alien….People talked about aliens as if they landed from outer space, as if they weren’t really people. I wanted to put a face on them: I wanted to humanize them.” Born in El Paso in 1940, Jiménez began studying art as an undergraduate at The University of Texas at Austin and received his Bachelor’s degree in 1964. 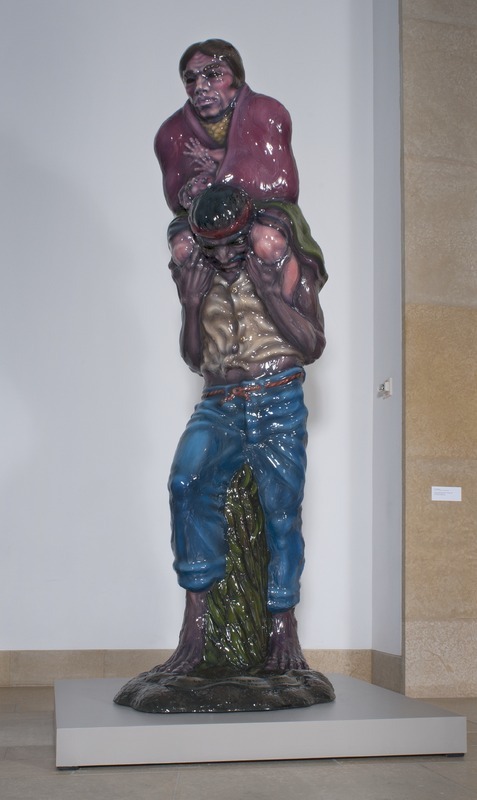 Luis Jiménez, “Cruzando El Rio Bravo [Border Crossing],” Blanton Museum of Art Collections, accessed April 26, 2019, http://utw10658.utweb.utexas.edu/items/show/2921.